Deborah Smith first heard the strange rumbling from the seafloor in 2001 and was eager to get to the bottom of it. The ocean commotion was detected by underwater hydrophones near the Mid-Atlantic Ridge, part of the 40,000-mile undersea volcanic mountain chain that winds around the globe. Scientists have come to expect shakes, rattles, and rolls along mid-ocean ridges, where Earth’s tectonic plates are spreading apart and magma from deep within the planet rises and erupts at the surface. But the seismic activity Smith detected was coming from an area 35 miles away from the ridge—a western front that should have been all quiet. “We had no idea why it was there, and that’s what we were looking to solve,” said Smith, a geophysicist at Woods Hole Oceanographic Institution (WHOI). In 2005, she successfully petitioned the National Science Foundation to extend a research cruise going near the region for another eight days, so she could investigate and map the curious “noisy” area near latitude 13°N, roughly 1,500 miles east of the Caribbean island of Barbados. Looking to solve one puzzle, however, Smith may have serendipitously found clues that shed light on an even larger mystery: how the ocean’s crust forms and evolves to shape the face of our planet. It turns out that a quirky seafloor feature, which scientists once considered rare, may be rather common and play a key role in the evolution of Earth’s surface. The discovery, reported last summer in the journal Nature by Smith, Johnson Cann of the University of Leeds in the United Kingdom, and Javier Escartín of the National Center for Scientific Research in France, has sparked widespread interest. Scientists began to grasp how Earth forms new crust by analyzing maps of ridges in the Pacific Ocean and Atlantic Oceans. The relatively simple and uniform appearances of the Pacific ridges made them easier to figure out. Beneath the ridge lies a chamber of magma—rocks melted by heat from Earth’s interior. (If the seafloor were a thin bar of chocolate, the magma chamber would be an underlying pool of hot fudge.) As Earth’s tectonic plates spread apart at the Pacific Ocean ridges, the magma oozes upward, spills over at the surface, and flows laterally on both sides of the ridge, until it is re-solidified by cold seawater to create a veneer of new ocean crust. Atlantic Ocean ridges, however, look more motley and complicated. Atlantic tectonic plates spread apart more slowly, and magma rises more sporadically. The hot magma sources beneath Atlantic ridges lie much farther from the surface, making the “chocolate bar” of overlying crust more like a thick brick. The crust is colder and more brittle, so when it is stretched by spreading tectonic plates, it forms cracks, or faults, extending from the surface downward. Slabs of crust above and below faults can slide along the fault surfaces and then topple like falling dominoes. The details of how new crust forms at slow-spreading ridges remained enigmatic, which of course, only motivated geologists such as Brian Tucholke at WHOI to seek answers. On an expedition in the early 1990s, Tucholke found “strange, elongated features along the Mid-Atlantic Ridge that stretched out perpendicular to the ridge,” he said. They were large, smooth domes up to 10 to 20 miles long that were lined with ridges like a corrugated tin roof. “We didn’t really understand what they were, and we kind of ignored them,” Tucholke said—until 1996 when a team of British and American scientists mapped one of these “strange, elongated features” in detail. The ’96 research team included Smith and Cann. Their target was the Atlantis Massif—a dome a few miles east of the Mid-Atlantic Ridge at 30°N that sticks up much higher than surrounding seafloor hills. It is 10 miles in diameter and rises 14,000 feet above the seafloor, about as tall as Mount Rainier in Washington state. The scientists discovered that the Atlantis Massif was made of peridotite, a dense, greenish rock usually found many miles below ocean crust in a deeper layer of the Earth called the mantle. Nearby was clue No. 2: a fault slanting downward from the seafloor into the ocean crust. “That’s when the light dawned,” Tucholke said. The scientists realized that the strange dome and the fault were linked. The fault was a type known as a “detachment fault.” It was large and long, reaching down into the upper mantle. Over hundreds of thousands of years, as the tectonic plates pulled apart, a mammoth block of mantle rock was pulled up along the fault and toward the surface and eventually rolled over on the seafloor. The exhumed dome, called a core complex, was effectively woven into the fabric of “new” ocean crust. The “corrugations” on the dome—like fingernail scratches on a milk chocolate bar—formed as the blocks slid against overlying rock on their way up. 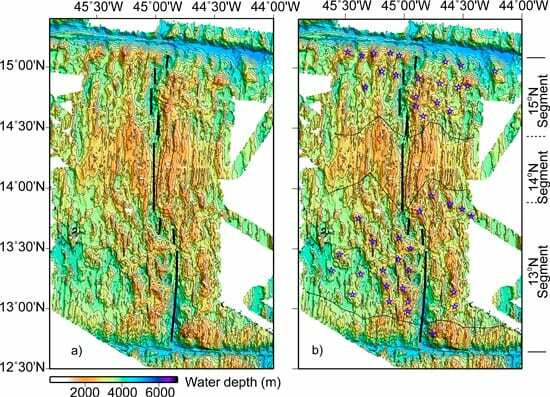 The effort to map the Atlantis Massif was a big leap forward for scientists studying slow-spreading ridges, Tucholke said. Still, core complexes and detachment faults were considered more like curious aberrations to Earth’s “normal” way of forming new crust. That is, until Smith’s expedition in 2005. 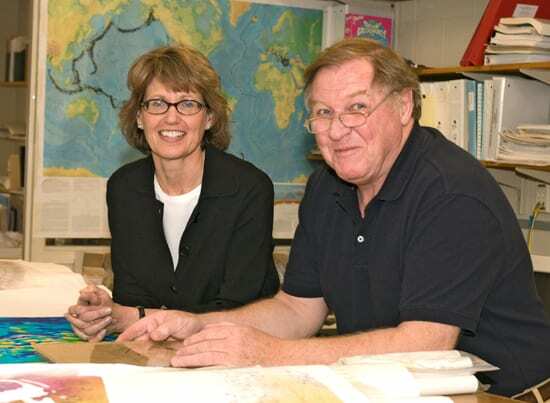 Smith and colleagues pored over the geophysical data collected on the 2005 expedition, searching for clues—not to the formation of ocean crust, you’ll recall, but to the mysterious seismic activity detected west of the ridge. Smith’s moment of scientific serendipity arrived while she sat staring at the computer screen in her lab at WHOI. In a kaleidoscope of multicolored seafloor map data from 13°N, a spectacular image soon came into view. What popped out the most were the grooves, or corrugations: They looked just like the ones on the Atlantis Massif farther north on the ridge, she said, which she and others had mapped 10 years earlier. “That was the a-ha moment,” Smith said. Then she realized she was looking not at just one core complex, but a series of core complexes at various stages in the sequence of their formation—from bumps that indicated the emergence of a core complex to the faded grooves of long-exhumed core complexes that had been eroded away over millions of years. Understanding of the geometry and nature of the faults that form core complexes is advancing in leaps and bounds, Smith said. She and Schouten were funded by the National Science Foundation in 2007 to continue their work in the region, and Smith and a team of colleagues just submitted another paper about the “graveyard.” They continue to unwrap the details of how core complexes form by re-examining old data and gathering new data. 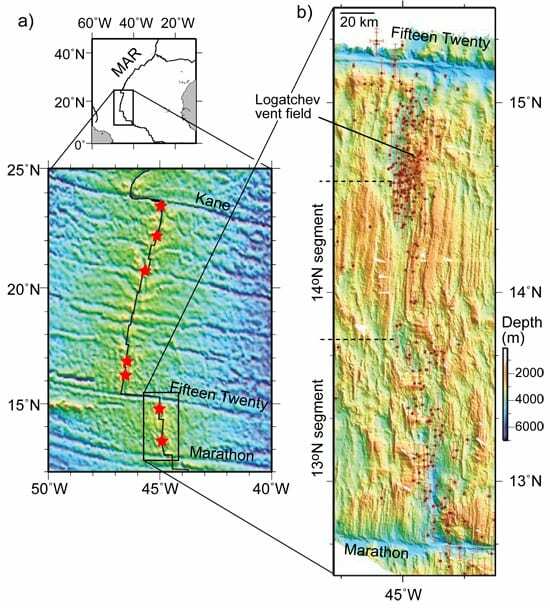 Woods Hole colleagues Rob Reves-Sohn, Susan Humphris, and Pablo Canales, for example, recently analyzed data from a mineral-rich mound as big as the Roman Coliseum on the Atlantic seafloor, called the TAG hydrothermal field. It sits atop a detachment fault, which the scientists found veers steeply downward and penetrates deeply. The fault likely acts like a superhighway for hot, mineral-rich hydrothermal fluids to circulate toward the surface and build mineral deposits, Reves-Sohn said. Those deposits can grow massive, because detachment faults persist for hundreds of thousands of years, he said. It’s Poseidon’s version of an old tale: the weirdo no one cared much about in grade school turns into the college hunk. Once overlooked, core complexes are now attracting more and more attention, Escartín said, and scientists are also working on mechanisms to explain them. Nearly 50 core complexes have been found, because scientists are looking for them and now know what to look for, Tucholke said. Unlike fast-spreading ridges, slow-spreading ridges (and the even more recently explored ultraslow-spreading ridges) lack a steady supply of magma. Tucholke and his colleagues are working on what they call a “Goldilocks Hypothesis.” Detachment faults along slow-spreading ridges need just the right amount of magma: not too little and not too much so rocks don’t crack when stretched to form faults, but just enough to induce sliding on the fault. Core complexes also expose “tectonic windows” into Earth’s crust and mantle, Tucholke said. Instead of drilling though more than two miles of crust—something scientists have dreamed about since the 1960s— “core complexes effectively lay out a cross-section of slow-spreading crust on the seafloor,” he said. “And it’s not a fool’s errand to study them and drill in various places” to gain a window into crust-manufacturing processes at slow-spreading ridges, where more than half of Earth’s ocean crust is created. The discovery has also jazzed up landlubber geologists, who have studied core complexes on land for decades to learn how Earth’s continental crust was made, Cann said. 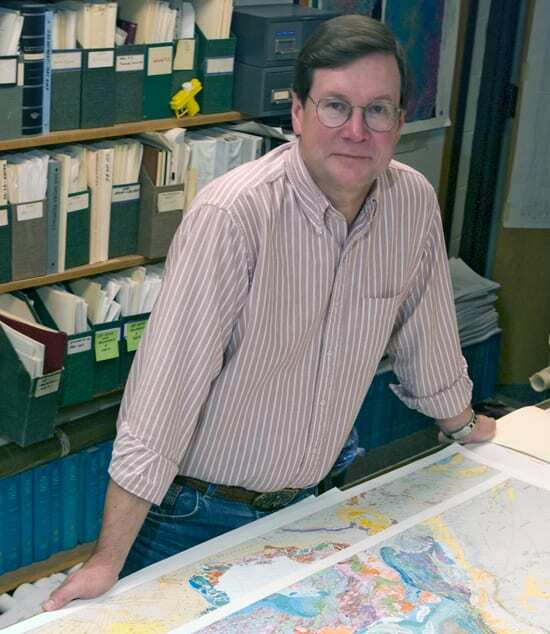 But while “continental core complexes are all old and eroded away,” Smith said, the seafloor offers young, pristine, more complete examples of the geological processes that also shaped the land beneath our feet. And what about that strange deep-sea rumbling that led Smith and company to the graveyard-turned-gold mine of core complexes in the first place? “So much of science is being in the right place at the right time,” Escartín said. Brian Tucholke’s research has also been funded by the National Science Foundation. A 1998 article from Oceanus magazine on core complexes by Brian Tucholke.